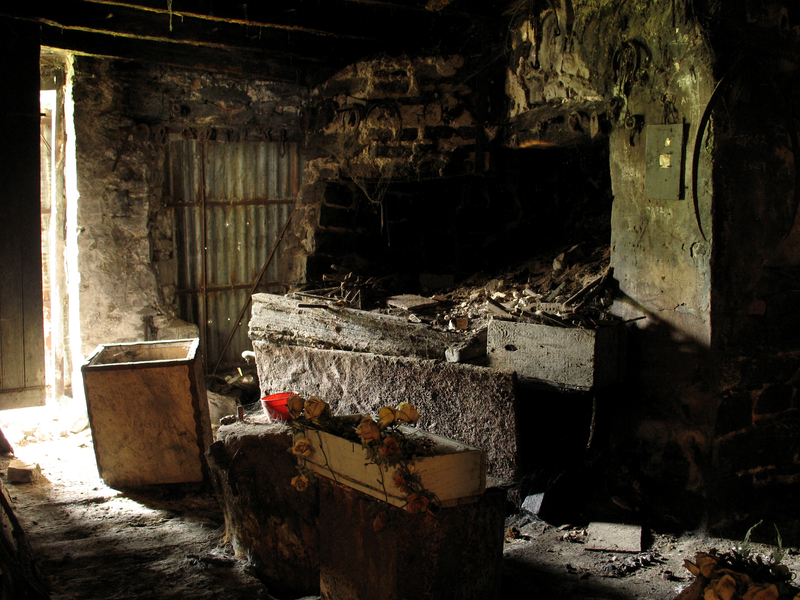 The northeast corner of the forge interior (Digital Photograph: Brian Mac Domhnaill, June 2005). The part of the building used as a forge had an earthen floor and a furnace set within the east wall. The chimney was found to be within the wall of the neighbouring property. Most of the tools, although well rusted, were still hanging on the walls or strewn about the floor. The anvil was noticeably missing from its mount. There was a pillar drill to the south of the room and some small hand tools and a large bellows in the lean-to shed to the rear of the building. The ashes in the furnace were more likely the remains of a fire for warmth set long after the forge had ceased operation in the late 1950’s – early 1960’s. Kathy would have sorely missed the constant heat from the forge in winter months, not to mention the banter between her brothers and their customers, who reportedly brought their horses in through the front door to be shoed. 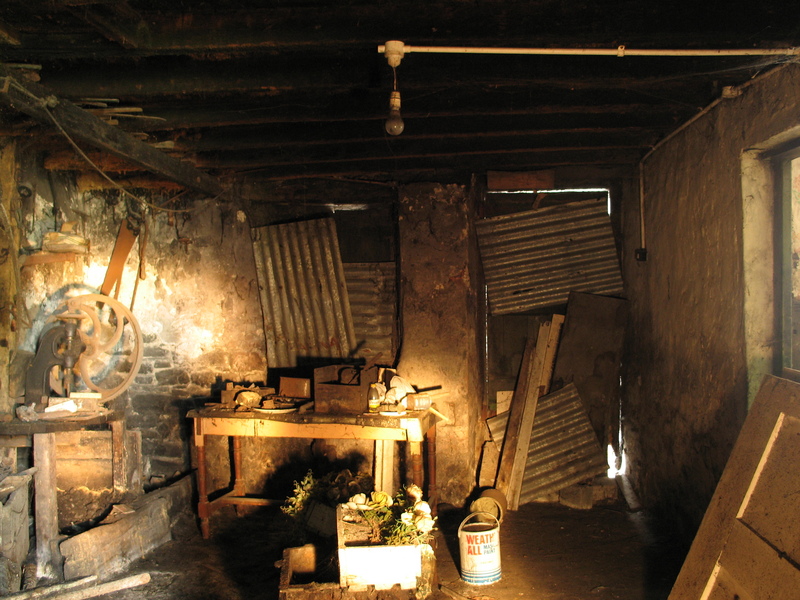 A light-painted photograph of the south end of the forge interior (Digital Photograph: Brian Mac Domhnaill, June 2005). I didn’t get to engage with this part of the building as much as I would have liked. Because of the blocked doorways and window there was very little light entering the room so photography options were limited. For the archaeological desk-based assessment I used some straightforward flash photography and some long exposures, sometimes light-painting with a torch. It would not have been practical to fully salvage the contents of the forge given my limited storage and transport options. I had very little time at the site to start with and each subsequent visit was with the kind permission of the client. I didn’t want to push my luck. Kathy used the forge as a shed in later years, storing random bits and bobs including some plastic flowers and a tin full of buttons. I had no informed salvaging strategy. From the lean-to shed I took away a ‘hammerstone’ (BFK001) and a hammer (BFK002) and from the forge itself I took one illustration (BFK003) and a thimble (BFK004). 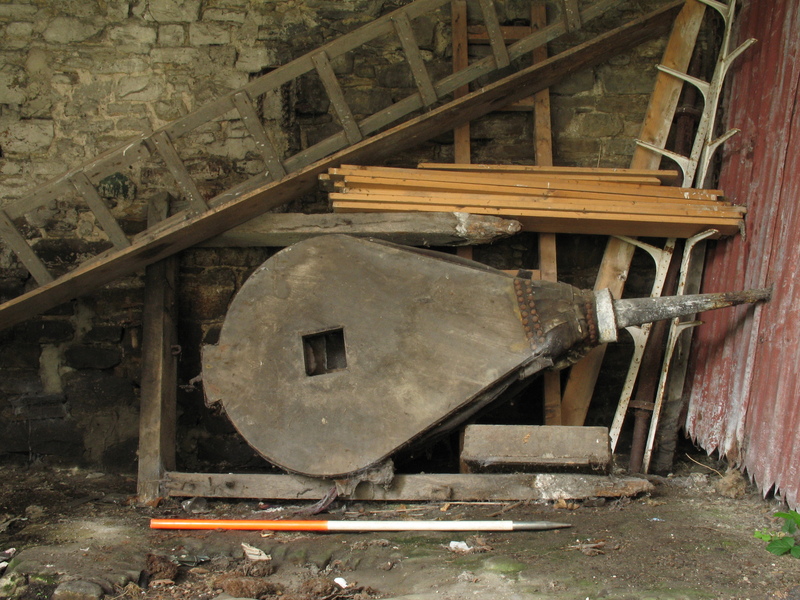 Large bellows in lean-to shed (Digital Photograph: Brian Mac Domhnaill, June 2005). Previous PostNon-archaeological desk-based assessment of completed development.